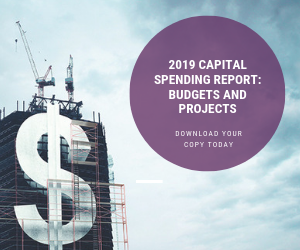 Our annual capital spending survey foresees a healthy 16.6 percent increase as food and beverage companies pump up the size of their building projects. Make ’em bigger and build ’em faster. Those seem to be the imperatives driving food plant construction projects, according to the engineering firms that execute them. They say their food customers are going for ever-larger projects and narrowing the time window for completion. Capital spending looks like it’s on the verge of an increase. The 35 public companies in Food Processing’s Top 100© have budgeted $17.5 billion for capital spending for the year just under way, according to our analysis of their financial filings and research by the Value Line investment advisory service. That’s a healthy 16.6 percent increase over what they actually spent last year, and 8 percent over what they budgeted for 2018 at this time last year. Whether they'll actually spend $17.5 billion remains to be seen. This is a tough time for most big food companies, and they've underspent their capex budgets for five years in a row now. Projects are also keeping pace with last year when it comes to size. Food Processing has identified 12 ongoing food construction projects with budgets of at least $100 million, about the same as last year. Topping the list is a $555 million complex in St. John's, Mich., for Spartan Michigan, a joint venture of four dairy giants. Maple Leaf Foods is building a 640,000-sq.-ft. poultry plant in London, Ontario. The $502.9 million project will allow Maple Leaf to close three existing facilities. And Uncrustables, the frozen peanut butter and jelly sandwiches that have been a consistent star for J.M. Smucker, are getting a dedicated plant in Longmont. Colo., that will cost $340 million. Sheer scale was the driving force for the size of the second-most expensive project on this year’s list, that $555 million cheese and whey processing plants being built for Spartan Michigan on a 146-acre campus in St. John’s, Mich. The complex, a joint venture of dairy giants Dairy Farmers of America and Glanbia PLC plus Select Milk and Proliant Dairy Ingredients, will process more than 8 million lbs. of milk a day when it comes on line next year. In planning the Michigan plant, Glanbia drew on experience with large-scale projects, says John Dardis, senior vice president of Glanbia Group sustainability and corporate affairs. Another motivation for large projects is the desire to consolidate existing operations to make them more efficient, says Tyler Cundiff, vice president of business development for food and beverage at Gray Construction (www.gray.com). Consolidation of this sort often comes about because a company is in a position to solve several problems with aging plants, such as outdated technology, safety concerns or labor issues, he says. “They can solve a lot of those challenges by consolidating, which oftentimes may end in a new greenfield, highly automated, world-class, state-of-the-art facility that can replace one or two or three facilities,” Cundiff says. A new facility for Champion Petfood is being built by Gray Construction Canada Co. in Parkland County, Alberta. Being big also helps versatility, which is important to meet demands for variety in SKUs, package sizes and everything else. Satisfying a variety of customer demands often requires a variety of machinery, which takes room. Another factor that can serve to increase plant size is the need to avoid cross-contamination, which is especially pronounced with heightened awareness about allergens. “Food safety has created greater demand for segregation to prevent cross-contamination,” says Tom Rychlewski, a project manager for design-build firm CRB (www.crbusa.com). “When you start adding segregated spaces, along with access spaces, it ultimately can increase the footprint of the plant.” He adds that careful planning, with the help of a design partner, can help to mitigate this effect. The projects may be getting bigger, but customers aren’t giving the construction companies any more time to build them — just the opposite. In large part, this is driven by the desire for speed to market. That’s been a factor in the food industry for a long time, but it’s intensifying for several reasons. Larger companies need to compete with smaller, more nimble “boutique” food companies that are quicker to cater to sudden shifts in consumer preferences. A.T. Kearney estimates that within the next three years, up to $100 billion in sales growth will shift to smaller companies, says Bahige El-Rayes, a partner in the consumer and retail practice. “This can be achieved either by allocating capital to buy smaller and more agile companies and/or by fundamentally transforming the way companies go to market and operate their plants,” El-Rayes says. Also, when a new SKU takes off, filling the sudden demand often requires added capacity. That’s why Mars Wrigley is spending $142 million to expand its plant in Cleveland, Tenn.; it needs more lines to produce hazelnut M&Ms. Design-build firms are meeting this need for speed in several ways. One is simply to hire more hands to do the work, often on a subcontract basis. VandeZandschulp says that on jobs with compressed timeframes, Gleeson will bring in subcontractors who might specialize in things like electrical work or sprinkler systems, or who are just available as extra hands, maybe on night shifts. “It’s the same number of man-hours, but you have to do the man-hours in less time,” VandeZandschulp says. Another strategy is to use prefab panels and other components. “There is a continuous effort to modularize and prefab to bring projects in on a tighter schedule and at a lower budget,” says Larry Klein, regional leader for CRB. One of the basic decisions any company has to make is whether to expand space they already own, or renovate an existing building — their own or someone else’s. Of the projects we’ve identified with a value of $30 million or more, there’s an almost even split: 10 new constructions against 11 renovations, conversions or expansions. Jim Cathcart, senior director of project planning at The Austin Co., says almost all firms first look to internal expansion. “Capital projects are expensive,” Cathcart says. “The initial focus will typically evaluate increased throughput capacity within the existing infrastructure: rework lines, install packaging mezzanines within the existing envelope, improve hygienic zones through food-grade renovation. Greenfield plants make sense in regions with favorable investment incentives, adequate infrastructure, reliable labor, affordable utility rates, and when they have maximized their existing facility.” He says Austin currently is seeing about a 70/30 split between expansions and renovations versus new construction. There’s a third way that has been an option for a long time: taking over a “shell” building. Developers sometimes put together minimally equipped structures, little more than four concrete walls, as a sort of speculative investment, waiting for a customer to come along. Sometimes the developer will rent out the space for storage while waiting for a customer. This proposition can be tempting for a business that wants a quick and relatively cheap new plant. But it has pitfalls, Allsup says. The problem is that shell buildings often have structural aspects that aren’t suited to food operations, at least not without a lot of expensive corrections, like floors that aren’t sloped properly for drainage or a roof that isn’t strong enough to support a refrigeration system. He mentioned a project where a prominent meal-kit company took over a half-million-square-foot existing shell and ended up having to reinforce it, tear up floors, put drains in and make other expensive improvements. “What appears on the surface to be a great deal, when you do all those kinds of additional efforts, it may not be as sweet a deal as you think,” he says. In a way, falling for the pitfalls of a shell building is a symptom of a larger condition that affects many food companies as they undertake large construction projects. Simply put, many of them no longer have the in-house expertise to evaluate options and make decisions. That’s why some firms that specialize in food plant construction are evolving toward providing services beyond the actual building. Gray Construction, for instance, has acquired divisions including InLine Engineers, which provides project management services, and GraySolutions, for automation and control engineering. This allows Gray to undertake all aspects of a project. “We are seeing more and more customers ask for that delivery model, which could be called more of a turnkey delivery model, where they want a single entity to manage all the components of the project,” Cundiff says. These components include the major utilities, which, in the food industry, often present unique challenges when it comes to integration into construction. Food safety is another aspect that needs to be integrated into construction plans, for both buildings and equipment. It’s becoming more of a priority in the industry, Rychlewski of CRB says. Jim Whitehead, vice president of sales and marketing for Pacific Southwest Structures Inc. (www.pssiconcrete.com), says this needs to be addressed at the beginning of a project. The bottom line, Allsup says, is that in a construction project, as with most enterprises, knowledge is power – and the right partner can provide that power.